This is a microscope image of tiny buckyballs lined up on a layered graphene surface. Image: Kim Lab/Brown University. A decade ago, scientists noticed something very strange happening when buckyballs – soccer-ball-shaped carbon molecules – were dumped onto a certain type of multilayer graphene, a flat carbon nanomaterial. Rather than rolling around randomly like marbles on a hardwood floor, the buckyballs spontaneously assembled into single-file chains that stretched across the graphene surface. Now, researchers from Brown University's School of Engineering have explained how the phenomenon works, and that explanation could pave the way for a new type of controlled molecular self-assembly. 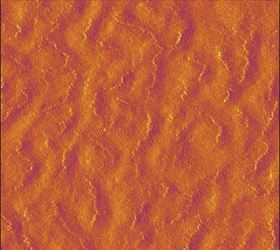 In a paper published in the Proceedings of the Royal Society A, the Brown team reports that tiny, electrically charged crinkles in graphene sheets can interact with molecules on the surface, causing the molecules to arrange themselves in line with electric fields that extend along the paths of the crinkles. This new paper is a follow-up to an earlier paper by Kim's team, in which they described how gently squeezing sheets of layered graphene from the side causes them to deform in a peculiar way. Rather than forming gently sloping wrinkles like you might find in a rug that's been scrunched against a wall, the compressed graphene forms pointy saw-tooth crinkles across the surface. These form, Kim's research showed, because the arrangement of electrons in the graphene lattice causes the curvature of a wrinkle to localize along a sharp line. The crinkles are also electrically polarized, with crinkle peaks carrying a strong negative charge and valleys carrying a positive charge. Kim and his team thought the electrical charges along the crinkles might explain the strange behavior of the buckyballs, partly because the type of multilayer graphene used in the original buckyball experiments was HOPG, which naturally forms crinkles when it's produced. But the team needed to show definitely that the charge created by the crinkles could interact with external molecules on the graphene's surface. That's what the researchers were able to do in this new paper. Their analysis using density functional theory, a quantum mechanical model of how electrons are arranged in a material, predicted that positively charged crinkle valleys should create an electrical polarization in the otherwise electrically neutral buckyballs. That polarization should cause buckyballs to line up, each in the same orientation relative to each other and spaced around 2nm apart. Those theoretical predictions match closely the results of the original buckyball experiments, as well as repeat experiments newly reported by Kim and his team. The close agreement between theory and experiment helps confirm that graphene crinkles can indeed be used to direct molecular self-assembly, not just with buckyballs but potentially with other molecules as well. Kim says that this molecular zippering capability could have many potential applications, particularly in studying biomolecules like DNA and RNA. For example, if DNA molecules can be stretched out linearly, they could be sequenced more quickly and easily. Kim and his team are currently working to see if this is possible.